James Eastment was born at Hardington Mandeville in 1880. He was the sixth of the eight children of carter and agricultural labourer James Eastment (1838-1902) and Thirza Jane née Chester (1844-1894). In the 1881 census James and Thirza were listed living at Hardington Mandeville with five of their children, including 10-month old James Jnr. By 1891 the family had moved to Pendomer and 11-year old James was working as an agricultural labourer like his father and tow older brothers. In the 1901 census James was listed living with his brother-in-law's family at Rustywell. James was working as a box packer at the butter factory of Aplin & Barrett. In 1904 he married Ellen Hutchings (1876-1962). They were to have three children, all born in Preston Plucknett; Leslie Charles (1905-1995), Hettie Irene (1909-1974) and Edith Clara (1914-1999). The 1911 census listed the family living at 15 Larkhill Terrace, Preston Plucknett. James, by now aged 31, was working as a labourer in the butter factory. It is not known when or where James enlisted, but it was probably towards the end of 1917. 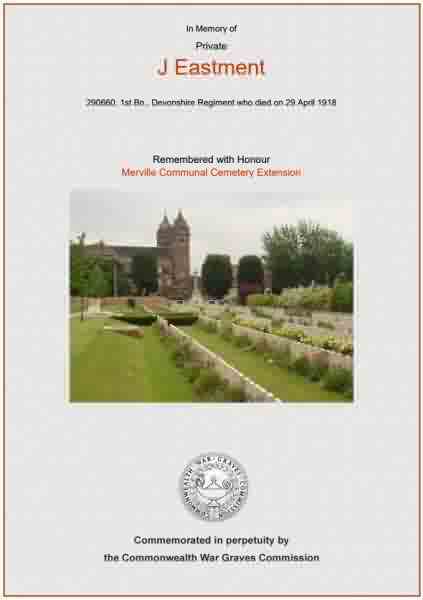 He was a Private in the 1st Battalion, Devonshire Regiment with the late Service Number 290660. James was killed on 29 April 1918. He was 38 years old. James Eastment's name is recorded on Special Memorial at IV.D.6., Merville Communal Cemetery Extension, Merville, Departement du Nord, Nord-Pas-de-Calais, France, and his name is recorded on the Preston Plucknett War Memorial. The Commonwealth War Graves Commission certificate in memory of James Eastment.